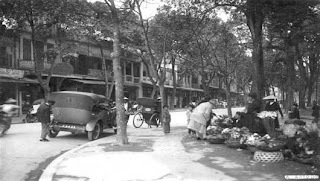 There was a time the French colonial time, the Hang Tray including end of Trang Tien street. The reason for calling Hang Tray because here professional jobs about pearl inlaying furniture, including tray. “Before (1884 – 1890) throughout a city of Hanoi has many shops of mosaic workers. They quietly work hard… to bring about the French soldiers as souvenirs. ” The above line in the book History of Vietnam (Publishing House of Social Sciences-1971) wrote about Hang Khay street (also known as Tho Kham street). It lies on the ground to connect from Huu Vong lake to Tay Long city gate in Le dynasty, ancient land of the Thi Vat village and To Moc Tong Tien Tuc, Tho Xuong district, Hanoi. Mosaic craft village origin from Chuon Ngo, Chuyen My Commune, Phu Xuyen District, Ha Tay province (old now belong Hanoi). The elderly in the village said that there are many excellent inlay craftsmen in the village career they want to be promoted in areas where prosperous capital city, linked together, take the family out to work in Thang Long. Hang Khay birth, work more and eat better off, the workers together to build the temple worship ancestor in the Cuu Lau village(Trang Tien street today). After Cuu Lau village broke to open Trang Tien street, so the temple was also demolished. There are other theories, in more detail about the process of migration from Chuon villages to Hanoi set up Hang Khay street. According to Mr Vu Van Tran (the man of Chuon village), the ancestor mosaic craft Chuon village last name Vu, named Vu Van Kim. The son of Mr Kim is Vu Van Ngan particular family and a number of skilled workers in the village to Hanoi to work and founded the Hang Khay, this time to be determined at about the 19th century. There are many different opinions, adding that the situation of older material written so poorly, so the time of formation of Hang tray hard to confirm accuracy. 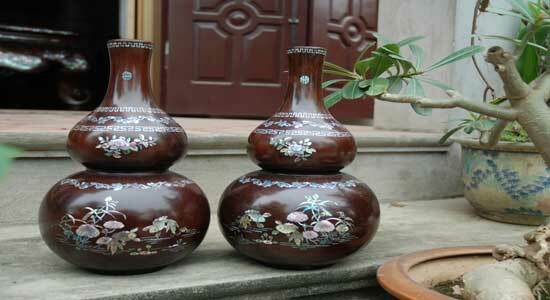 Pearl mosaic is high ranking handicraft. 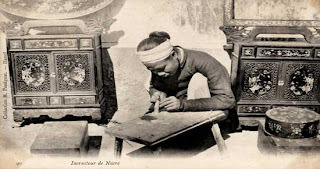 Worker’s primary job is to make horizontal board, parallel sentences for temples and other special items such as tea chests, screen, cigarette tubes, betel casket, tobacco boxes … with selected topics in the area of the ancient custom of gentleman. The stores in Hang Tray street both sales and production on the spot. The workers practice on the scale mosaic for each family or small group of foreman, craftsmen carving, filing workers, split and some minor workers. 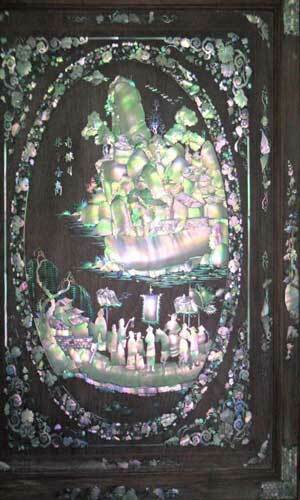 Pearl inlaying can be divided into two categories of products are mosaics on wood, copper, tortoise … and mosaic lacquer. As in Japan and China, professional lacquer with lacquer products in our already very early, but the combination of lacquer and inlaid son is only prevalent at the beginning of this century, when the level of position along with market communications and extend to all parts. At first, only son of inlaid wood products. In particular, rosewood is the most popular for fine grain but hard and solid. The background color of the wood is light red, pink, color with the texture of pearl,shell-fish to create color contrasts beautifully. Few centuries later, the product appeared on the mosaic bronze , then later more was on the tortoise inlay. And based on the usefulness, we can divide the products into two categories Chuon village and worshiping and appliances. Besides the products mentioned above, the Chuon workers mosaic depending on the requirements of the customer order as tobacco pipes handle, walking stick handle, pearl inlaying in small wine bottle by bronze cast , on the wood or stone ring. Depending on the value of the items which workers choose mosaic materials such as pearl, shell-fish… accordingly. The pattern inlaid look front of the shiny bright pink, bright look to cross the light of the flame up mysterious emerald color. The value of the eternal beauty products in the mosaic in part in such a mysterious light. 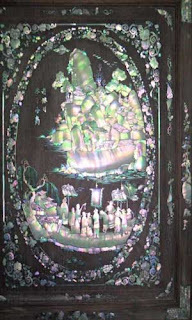 Besides pearl, in materials for mosaic have shell-fish a has been imported from Singapore, sometimes used to coordinate with embossed ivory pieces of the Japanese way. The shell is decorated using on big screen, sometimes they are mounted on the roof of temples. There are shell-fish in Japan with the name “Bear ear,” this kind of mottled colors, vibrant with many in the Gulf of Tonkin. After the French capital build offices, dealers, Hang Khay has become the most luxurious streets in Ha Noi, the mosaic shop gradually shrinks.